View of the lawn from the patio of the WUKY studio on Spurr Road. The Commons Crossing concert series will take place on the lawn each Saturday July 7 through Sept. 8. Photo by Whitney Hale. LEXINGTON, Ky. (July 2, 2018) — A recent visit to WUKY's new facility on Spurr Road in Lexington has resulted in a new, live music series being held Saturdays this summer on the grounds of the University of Kentucky's NPR station. Commons Crossing series of 10 free concerts kicks off 7 p.m. Saturday, July 7, with Joslyn and The Sweet Compression performing live from the lawn behind WUKY's studio at 2640 Spurr Road. The performance will also be aired live on WUKY 91.3 FM and online at www.wuky.org. 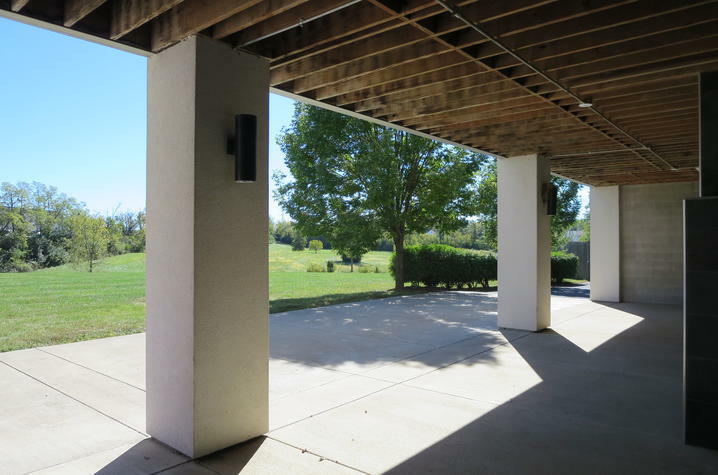 The idea for the Commons Crossing concert series originated when Ed Commons, producer of "Red Barn Radio," which airs on WUKY from 8 to 9 p.m. Saturdays, visited WUKY and was impressed not only with the studio facilities, but also with the beautiful patio and lawn behind the building. WUKY General Manager Tom Godell agreed to the idea that gives radio listeners in Central Kentucky and worldwide online the opportunity to learn more about the Lexington music scene. Commons Crossing refers to a railroad crossing because a rail line is near the venue and will add to the outdoor ambiance of the events. The free concerts will be held at 7 p.m. each Saturday through Sept. 8. Concertgoers are recommended to bring a blanket or lawn chair. Concerts will be held rain or shine. Matt Wickstrom, who hosts a program on Lexington Community Radio, will host the Commons Crossing series, which is also sponsored by VisitLex and Ale 8 One. Additional information and the artist list are online at www.WUKY.org. and https://www.facebook.com/commonscrossing/.